The Intenso Speed Line ships in a plastic bubble wrap. On the front of the package we found the capacity of the drive and details of a two year warranty. No read/write speed ratings were indicated on either the front or back of the package. The Intenso Speed Line measures 5.3cm long, 1.8cm wide and 0.7cm high. This is the smallest flash drive we have seen to date. With these dimensions there is no chance of obstructing adjacent ports on a computer, the drive is barely thicker than the USB port its self. The Intenso weighs just 9 grams making it extremely light as well as small. The body of Intenso Speed Line is reasonably solid and dense. There is a red LED indicator light on the back of the drive which is barely visible but flashes when the drive is in operation. The cap does not attach particularly well leaving it at risk of loss and the pin at the back of the drive which can be used to attach a keychain is also pretty weak. The test rig was a high end Core-i7 workstation kitted out with a 256GB Solid State drive and 16GB of RAM. The system was designed to be overclocked to 5GHZ but for the benchmarks, only the stock frequencies of 1.6GHz idle, 3.4GHz active and 3.8GHz turbo boost were used. 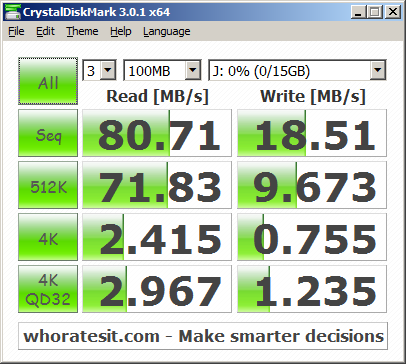 CrystalDiskMark is a free disk benchmarking utility that is very simple to use. It takes eight measurements: the read and write speeds in megabytes per second (MBps) for sequential, 512KB, random 4KB and 4KB parallel disk operations. There are more screenshots from this benchmark posted on the web than any other, probably due to its clean and simple display. There is further information, including instructions on how to benchmark your own drives, on the CrystalDiskMark wiki page. The Intenso scored 81/19 MB/s in the sequential read/write tests. Both of these scores are about average for a USB 3.0 flash drive. The area that stands out most for the Emtec is its weak 4K read score of just 2.4 MB/s which is amongst the lowest scores we have seen. In practical terms this drive is not well suited to running portable applications. The Atto Disk Benchmark has probably been around for longer than any other disk benchmarking software, and you can tell from its dated interface! The utility was designed to measure regular disk drive performance but it's more than up to the task of measuring both USB flash drive and SSD speeds as well. The utility measures disk performance rates for various sizes of file and displays the results in a bar chart showing read and write speeds at each file size. The results are displayed in megabytes per second (MBps). There is further information, including instructions on how to benchmark your own drive, on the Atto wiki page. The ATTO results for the Intenso are broadly in line with the CrystalDiskMark scores and at 88/20 MB/s come in over Intensos claimed read/write speeds of 60/25 MB/s. This test shows that the Intenso Speed Line would take 69.30 seconds to create a copy of a large 1GB video file. Generally flash drives complete this test at roughly half their sequential write rates. The Intenso performed relatively well in this test. 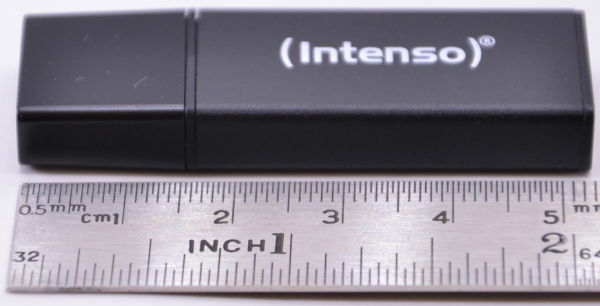 The Intenso Speed Line has a slightly below average performance profile for a USB 3.0 thumb drive but it is priced extremely aggressively making it excellent value for money at this time. As well as representing good value for money the Intenso is also both the smallest and the lightest thumb drive we have seen to date. The only thing to watch out for with this drive is its below average 4K read speed which makes it unsuitable for hosting applications or operating systems. 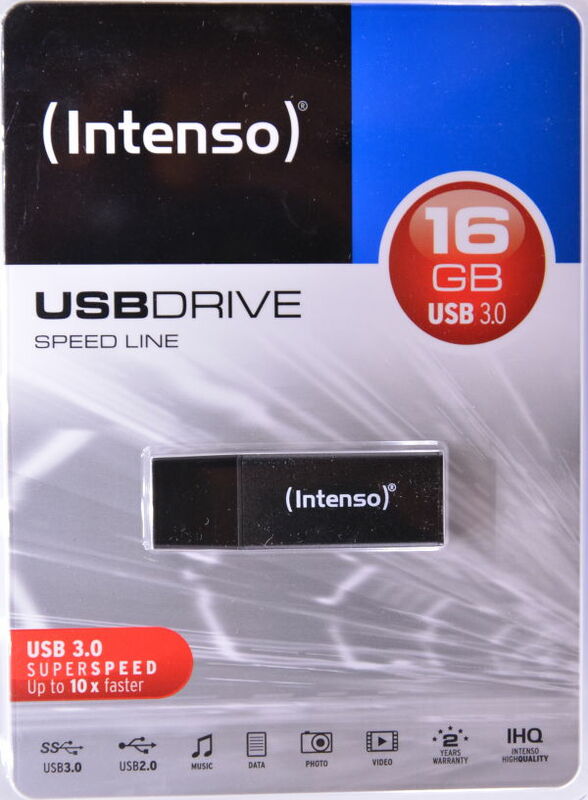 The Intenso Speed Line USB 3.0 16GB averaged 87.8% lower than the peak scores attained by the group leaders. This isn't a great result which indicates that there are much faster alternatives on the comparison list. 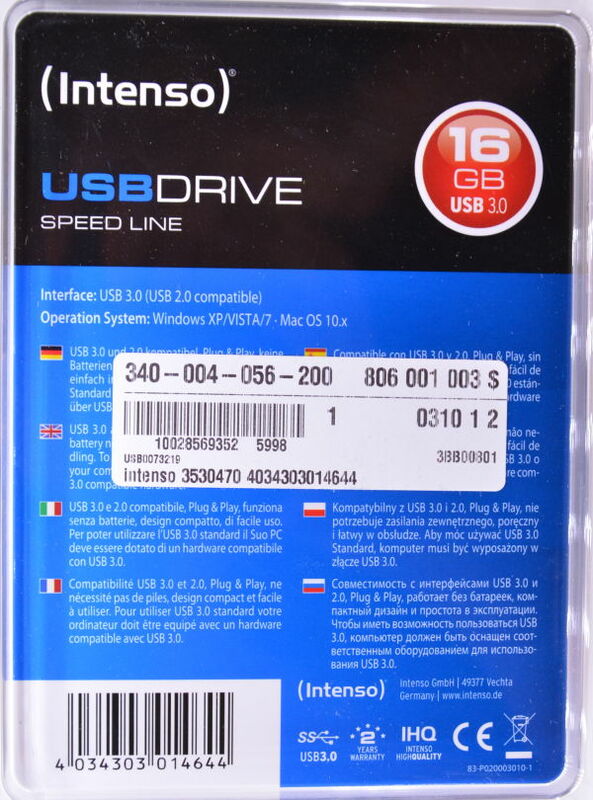 The range of scores (95th - 5th percentile) for the Intenso Speed Line USB 3.0 16GB is just 11.6%. This is a relatively narrow range which indicates that the Intenso Speed Line USB 3.0 16GB performs reasonably consistently under varying real world conditions. Read my full review and see the benchmark test results.